Four children came to seder. One was wise, one was wicked, one was simple, and one was silent. It was seder night at long last. The family gathered around the table, and Zayde (Grandpa, in Yiddish) began reading the Haggadah. Suddenly one child was heard to ask in an undertone: “What is going on here, anyway?” At that point another child muttered: “Yeah, what does all this mean to you? Let’s eat already!” Another child piped up: “I know what is going on. I know what he is reading. I know everything about Pesach.” The last child didn’t say anything, but managed to look manifestly bored, as Zayde continued reading the Haggadah, oblivious to the murmuring. No, that can’t be how it happened. I’ll try again. It was seder night at long last. The family gathered around the table, and Zayde began reading the Haggadah. Suddenly one child interrupted: “What are all these laws and customs and practices which God has given to you? I want to know.” Zayde began to explain the intricacies of Pesach law, when there was another interruption: “You tell us all these things, but what do they really mean to you, Zayde? Why do you still do them?” And before Zayde could finish responding to this question, a third sibling interrupted: “But what is really happening here tonight, Zayde?” Zayde smiled and began to explain, waiting for the last child to interrupt. But that kid was too busy reading the commentaries in the Haggadah to ask anything at all. Hmmm. I am not sure that that is the way it happened either. Four children there were at seder, one wise, one wicked, one simple, and one who did not know how to ask a question. But which child was which? Was the wise child smart–or a smart aleck? Was the wicked child bad–or challenging? Was the simple child really simple? And was the fourth child unable to ask a question–or unwilling to do so? Which one was which? 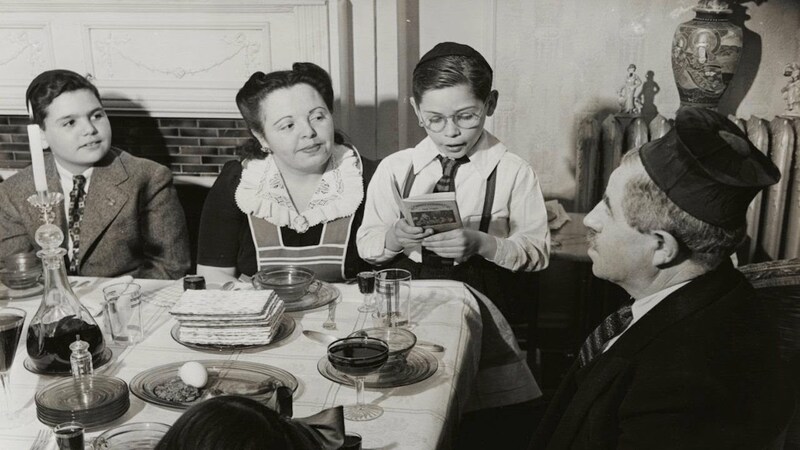 Four children there were at the seder, and we all take it for granted that one was wise and one was wicked, one was simple, and one did not know how to ask. But imagine that a parent declared: “I have four children: This one is the brain, this one the troublemaker, this one the dope and this one the silent.” Would we let such a statement pass? Would we let a teacher get away with saying, “I have four students, the brilliant one, the idiot, the loudmouth, and the one who never says a word?” What is the Haggadah getting at? Perhaps the Haggadah deliberately provides caricatures of four types of children to teach us something about the care we must take when we answer questions. Each person at our seder is coming from a different place. This one is older and more experienced. That one has never been to seder before. That other one was sick and did not expect to make it to seder, but is there. That one never learned to read Hebrew, and that one knows French. By telling us the story of the four children, each with a distinct question and each with a distinct answer, the Haggadah is telling us to accept each person where they are and to begin from there. The questions that are asked must be addressed, and the questions that are not asked must be addressed. How we answer questions is a big responsibility. Try, for example, reading the story of the four children backward, with the answers preceding the questions. The story then becomes a demonstration of how our approach to answering questions can so strongly influence the kinds of questions that will be asked in the future. An open sharing of knowledge, such as is offered to the “wise” child, encourages more questions, more searching, and this is possible at any age and any level of learning. Defensiveness and belligerence–such as is offered to the “wicked” child, encourages belligerence at best and complete turn-off at worst. One of my favorite activities at the seder was to pass out different Haggadot and to compare illustrations of the Four Children. Depictions of the wicked child are particularly interesting. Many Haggadot render the wicked child as a knight or a soldier. It is not hard to realize where that image came from. 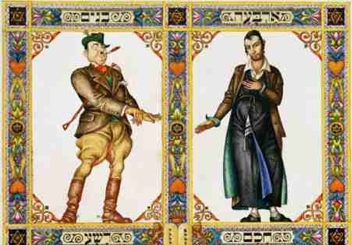 Haggadot from the early part of this century often depict the wicked child as a gambler or a gangster, complete with a cigar. A kibbutz Haggadah shows the wicked child as a city dweller. A communist Haggadah shows the wicked child as a business man. In introducing the tale of the four children, the Haggadah says: “k’neged arba banim dibra Torah.” This is usually translated as: “the Torah alludes to four children.” But perhaps it could also be rendered as: “The Torah speaks against the notion that there are four children.” One illustration that I find particularly meaningful comes from the Haggadah put out by the Rabbinical Assembly, and it shows paper cutouts of four bigger people with four littler people within. One cannot tell which child is which. As I see it, this illustration interprets the Haggadah to be teaching us that we are composite people. Sometimes we are this and sometimes we are that. Each one of us contains aspects of each child; each one of us is sometimes wise and sometimes wicked, sometimes simple and sometimes silent. We are the four children. As such we ask questions and we provide answers, different answers for different needs.